Grooved Rolls are wrinkle removing rolls from web materials for manufacturing, processing, Coating, converting. Many types of Rubber Grooved Roller are available as per specific requirement like Diamond Grooved, Helical Grooved, Straight Grooved, etc. For winder, Diamond Grooved Rubber Rolls required, Helical and Spiral Grooved Rubber Rolls can be supplied as per application requirements. 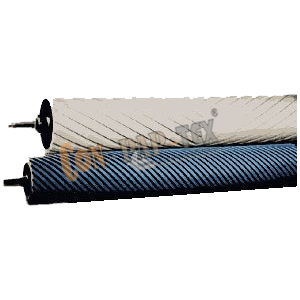 For winder, Diamond Grooved Rubber Roll required, Helical and Spiral Grooved Rubber Roller can be Provide as per program specifications.